High Strength Safety Netting Screen & Shade Screens can Protect Pets & Children from Accidents Caused by Inadequate Balcony, Porch & Stairwell Safety Railings! Hazardous safety barriers and railings can be made safer for pets and small children with the usage of ultra-high strength screen mesh. Safety barriers often pose a danger to children (or an escape route for pets) when the spacing between railing pickets is too great. Tensile Strength, Screen Density & Attachment are Important. A tensile strength of 150 lbs or greater is ideal. 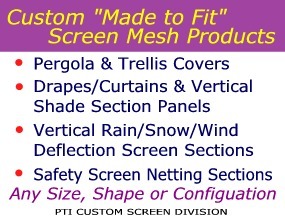 All PTI shade screen and PTI HD-60 (60% density) safety netting screen exceeds this rating. For protecting pets, it is wiser to use the 80% or 90% density screen because pets can get their teeth into and gnaw at the less dense material. Attachment should be made secure with well reinforced hemmed screen edges and proper mounting techniques at top, bottom and at both ends. Spur type grommets (grommets with teeth that hold into fabric) are generally used to allow either rope lacing or direct attachment through the grommet hole to the railing. Grommets should be spaced no more than 16 inches apart at top and bottom and preferably about 6 inches apart on the ends. If rope lacing, spacing the grommets at about 6 inches apart on all edges will result in a very neat appearance. Screen materials with very open weave are nearly unnoticeable when attached to a railing. However, if you are on a balcony or high porch and desire privacy from those looking up at you from below, consider using a shade screen material instead. Since you are relatively close to the screen, you will see out quite well. Those viewing from below (due to their distance away) will find seeing in very difficult.